Mirri Sparkle paper adds a fun twinkle to any paper craft project. This shiny metallic silver paper has a smooth texture and is glitter free. Do you love the glitter look but hate the mess from glitter? If so, you'll love Mirri Sparkle paper. Pictures can't do this paper justice. An intense glitter sheen sparkles light in all directions. But, This paper has the sparkle created by a special metallic sheet laminated onto a pure white base. This process means there is no glitter to flake off making a mess of your space. The colors are crisp and bold and provide an even color distribution for your eyes. The surface is lightly textured for a enjoyable tactile experience as well. Mirri Sparkle Paper makes a perfect addition to projects needing eye-popping pizzaz and glimmering highlights. 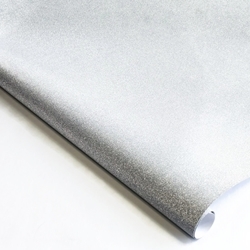 Each sheet of Silver Mirri Sparkle Paper casts a shiny metallic chrome shimmer across the entire sheet. The paper weighs 140 gsm and can be used in offset printing, but it is not inkjet or laser printer compatible. Enjoy large sheets measuring 24.5" x 35.25" or smaller 12" x 12" and 8.5" x 11" sheets. Now you can enjoy the glitz, glamour and sparkle of glitter paper without the usual mess! Available Sizes: 27.5" x 33.25", 12" x 12" and 8.5" x 11"